CHARLOTTE, N.C., April 17, 2018 /3BL Media/ -- Lineworkers have jobs unlike any other – they chase storms, climb poles and know the ins and outs of the energy grid – and, with the demands of the job, are always on standby when severe weather strikes. On April 18, we celebrate our lineworkers' role in powering the lives of millions of people across the country for National Lineman Appreciation Day. Their jobs are no easy feat and not for the faint of heart. Whether they are scaling a 40-foot pole or sky-high in an elevated bucket truck, lineworkers ensure power flows to vital infrastructure such as hospitals and water treatment facilities and to our everyday conveniences at home. And, safety always remains the top priority. 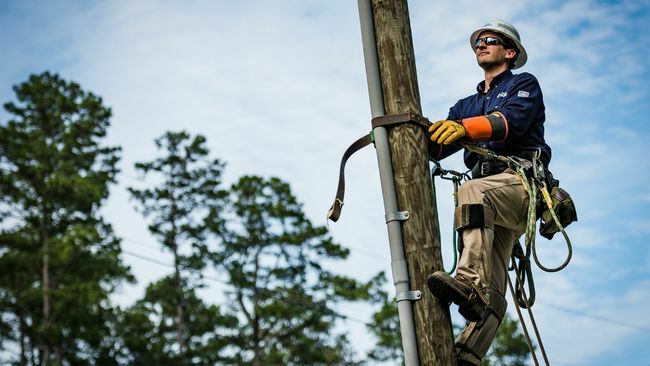 "Our lineworkers consistently demonstrate unwavering support for our customers and communities," said Lloyd Yates, executive vice president customer and delivery operations and president Carolinas. "Their heroic efforts on the front lines – often in difficult circumstances – are tremendous, and they deserve to be honored for their work that families and businesses throughout America rely on." Duke Energy's team of lineworkers battled storms, hurricanes and high winds the past year. Hurricane Irma caused more than 2 million power outages in Duke Energy service territories, and crews tackled restoration in the hurricane's aftermath. Duke Energy crews also joined the U.S. utility industry effort to help restore power to the island of Puerto Rico, the U.S. territory hit hard by Hurricane Maria last year. Crews worked on the island for nearly two months – away from their families – in harsh terrain left in the wake of the hurricane to help restore normalcy to residents of Puerto Rico. While more traditional aspects of the job such as climbing poles and towers remain, technology has enhanced the profession. Today, drones can be used to assess damage and string lines in areas with limited access following severe-weather events. New portable technology used by lineworkers in the field helps better inform customers on the status of outages including the cause, crew updates and the estimated time of restoration. More than 5,000 lineworkers are part of the Duke Energy family. They, along with thousands of contract lineworkers, are responsible for constructing, operating and maintaining equipment and more than 300,000 miles of power lines in Duke Energy's service territories – that is enough to wrap around the Earth 12 times. The 300,000 miles of power lines serve over 7 million customers – representing a population of more than 24 million people. Those who wish to honor lineworkers and their families are encouraged to use the hashtag #ThankALineman in social media. To view a letter from a lineman's wife expressing her appreciation for her husband's job serving the community, visit https://illumination.duke-energy.com/articles/after-32-years-i-m-still-proud-to-be-a-lineman-s-wife. To view a video of what a day in the life of a lineworker is like, visit http://illumination.duke-energy.com/articles/video:-a-day-in-the-life-of-a-lineworker.